Hybrid imaging techniques can provide functional and anatomical information about sentinel lymph nodes in breast cancer. Our aim in this study was to evaluate which imaging parameters on hybrid sentinel lymphoscintigraphy predicted metastatic involvement of sentinel lymph nodes (SLNs) in patients with breast cancer. 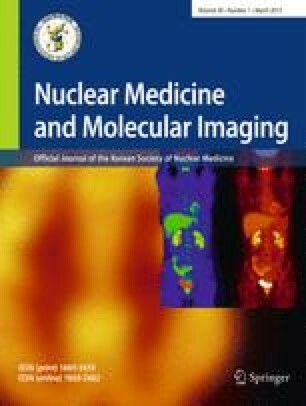 Among 56 patients who underwent conventional sentinel lymphoscintigraphy, 45 patients (age, 53.1 ± 9.5 years) underwent hybrid sentinel lymphoscintigraphy using a single-photon emission computed tomography (SPECT)/computed tomography (CT) gamma camera. On hybrid SPECT/CT images, we compared the shape and size (long-to-short axis [L/S] ratio) of the SLN, and SLN/periareolar injection site (S/P) count ratio between metastatic and non-metastatic SLNs. Metastatic involvement of sentinel lymph nodes was confirmed by pathological biopsy. Pathological biopsy revealed that 21 patients (46.7 %) had metastatic SLNs, while 24 (53.3 %) had non-metastatic SLNs. In the 21 patients with metastatic SLNs, the SLN was mostly round (57.1 %) or had an eccentric cortical rim (38.1 %). Of 24 patients with non-metastatic SLNs, 13 patients (54.1 %) had an SLN with a C-shape rim or eccentric cortex. L/S ratio was 2.04 for metastatic SLNs and 2.38 for non-metastatic SLNs. Seven (33 %) patients had T1 primary tumors and 14 (66 %) had T2 primary tumors in the metastatic SLN group. In contrast, 18 (75 %) patients had T1 primary tumors and six (25 %) had T2 tumors in the non-metastatic SLN group. S/P count ratio was significantly lower in the metastatic SLN group than the non-metastatic SLN group for those patients with a T1 primary tumor (p = 0.007). Hybrid SPECT/CT offers the physiologic data of SPECT together with the anatomic data of CT in a single image. This hybrid imaging improved the anatomic localization of SLNs in breast cancer patients and predicted the metastatic involvement of SLNs in the subgroup of breast cancer patients with T1 primary tumors. This study was supported by a grant from the National R&D Program for Cancer Control, Ministry of Health, Welfare and Family Affairs, Republic of Korea (No. 0620220). This work was also supported by a grant from the Nuclear Research & Development Program of the National Research Foundation of Korea (NRF) funded by the Korean government (No. 2009–0078422). Chang Ju Na, Jeonghun Kim, Sehun Choi, Yeon-Hee Han, Hwan-Jeong Jeong, Myung-Hee Sohn, H yun Jo Youn, and Seok Tae Lim declare that they have no conflict of interest. This study was approved by the ethics committee in our institution and was performed in accordance with the Helsinki Declaration of 1975, as revised in 2000. All patients enrolled gave their informed consent prior to their inclusion in the study.